Submitting works to groups is live! 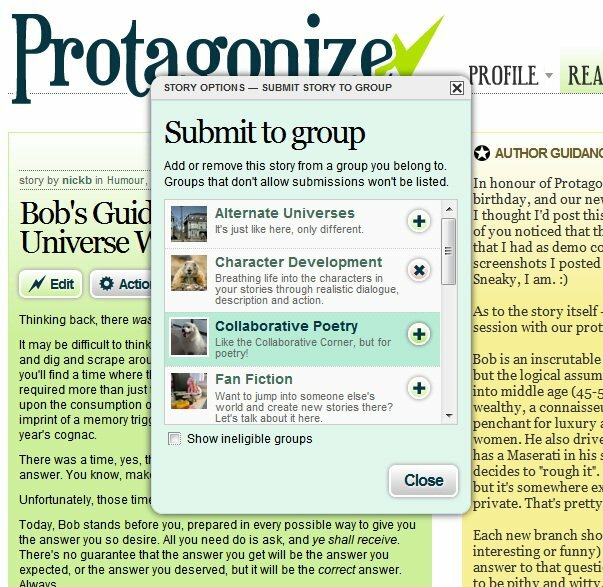 Some awesome news for everyone this evening — the ability to submit your stories, poems, and other works to groups is now enabled for everyone on Protagonize! Yes, it’s been a very long time coming. Thank you all for being so patient, and for being such dedicated members of our community. The feedback and support I’ve gotten from all of you along the way has been amazingly helpful in getting this major feature completed. It may sound like a simple addition, but it was somewhat complicated to implement, behind the scenes. The observant among you have probably already noticed that I’ve had this feature in testing with our beta group for the last week or so. I’d like to thank them all for their help and feedback over the last few days; they managed to catch a few bugs and suggest a pretty useful enhancement that I wouldn’t have added off-the-bat otherwise. I do have a couple more group enhancements coming over the weekend, but those won’t have any impact on submissions, so I figured I might as well get this out the door as early as possible. I’m sure you’re all wondering how things work, and the basics should be pretty clear over in the FAQ. Make sure to read that bit, before asking anything. Please make sure to clear your browser cache before letting us know about it. You could be seeing old code that your browser had leftover from earlier. Here are instructions on how to clear your cache. How do I submit something to a group? Use the Actions (formerly Options) menu on any story/poem or whatnot. You’ll see a new option entitled Add to or remove from group. Should be pretty self-explanatory. Groups that don’t allow submissions won’t be listed in the popup dialog. How do I remove a work from a group, as the original author? See above. Same dialog, just click the X instead of the + beside the group your story is in. Where can I see all stories/etc. submitted to a group? If a group allows submissions, you’ll see a Read tab at the top of the group. Go check that out. It’s been live all week, but you may not have noticed with only the beta testers submitting works. How do I remove someone else’s submission to a group I manage? Go to any of the browsing filters on your group’s Read page (i.e. Popular, Recommended, etc. ), aside from the Overview. If you’re a group manager, hovering over any work in the group will show a little X icon in the top right corner of that work’s listing. Click it to remove the work from the group. Can I configure my group to only accept certain types of content? Yes, read the new FAQ entry on this topic. Is content in Private groups hidden from the rest of the site? Yes. It’s also hidden from your total page/post count. Check the Groups FAQ for more details. How many groups can I submit any individual work to? Unlimited Public groups, or one Restricted access or Private group. See the FAQ for more details. Basically we can’t have overlapping access lists between multiple groups for a single piece of content, so that’s how it has to work. If I submit a collaborative story to a Restricted access group, who can add to it? That’s a tricky one. I’ve currently got it setup to allow all members of the Restricted group to add, as well as anyone who had previously added to the story. That’s one of the things I’m testing with the beta group. If it makes more sense to only allow the group members to add and lock out any other participants who are not members, I’ll change it. Opinions are welcome. Can I add a new story directly to a group, without posting it first? Not yet, but soon. The ability to create a new story directly in a specific group should be available in the next week or so. In the meantime, you’ll need to publish the story first, then add it to a group. What other stuff changed in this release? Questions, comments? Send ’em my way via email, or feel free to comment here. Enjoy the new features! This entry was posted in General, Groups, Site updates, writing and tagged access lists, awesome, groups, new features, private groups, security, submissions. Bookmark the permalink. 9 Responses to Submitting works to groups is live! *eyes boggle* Wow Nick, this is fantastic! Thank you so much! fiiiinally! a quick plug for the World Building group, which has a few stories/exercises already added to it that you should check out! “you” being everyone in general, heh. what if you could make role playing easier. Like it could be page, someone starts the idea in a group. Then on a role play page, they make a scene and build their character.